Proprietary Name: Betamethasone Dipropionate What is the Proprietary Name? Non-Proprietary Name: Betamethasone Dipropionate What is the Non-Proprietary Name? Betamethasone Dipropionate with NDC 70710-1233 is a a human prescription drug product labeled by Zydus Pharmaceuticals (usa) Inc.. The generic name of Betamethasone Dipropionate is betamethasone dipropionate. The product's dosage form is cream and is administered via topical form. FDA Application Number: ANDA208885 What is the FDA Application Number? 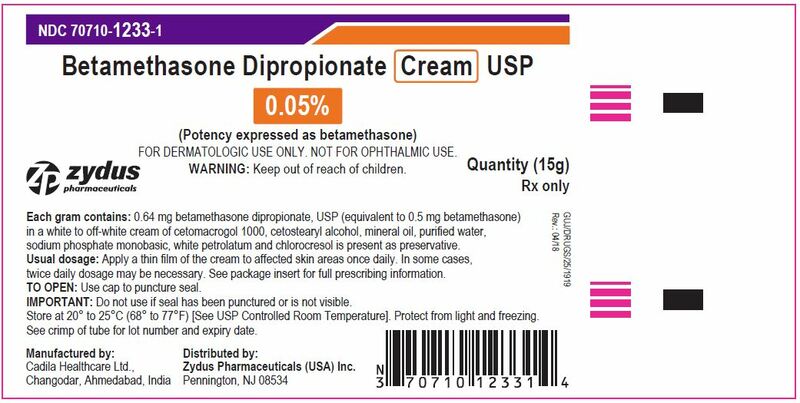 Betamethasone dipropionate cream USP, 0.05% contains betamethasone dipropionate USP, a synthetic adrenocorticosteroid, for dermatologic use. 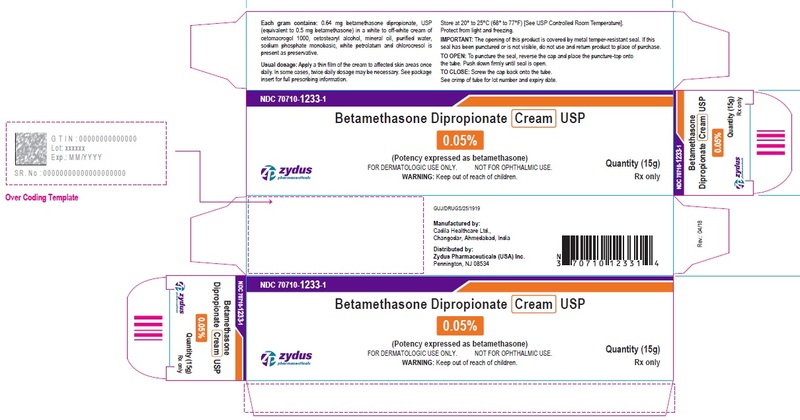 Betamethasone, an analog of prednisolone, has a high degree of glucocorticoid activity and a slight degree of mineralocorticoid activity.Betamethasone dipropionate, USP is a white to almost white crystalline powder. It is practically insoluble in water, sparingly soluble in alcohol and freely soluble in acetone, methylene chloride and chloroform.Chemically, it is 9-fluoro-11β,17,21-trihydroxy-16β-methylpregna-1,4-diene-3,20-dione 17,21-dipropionate. 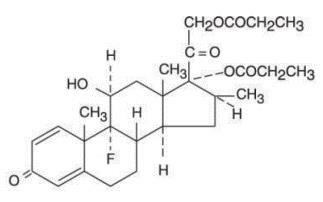 The structural formula is: Molecular Formula : C28H37FO7Molecular Weight : 504.60Each gram contains 0.64 mg betamethasone dipropionate, USP (equivalent to 0.5 mg betamethasone) in a white to off-white cream of cetomacrogol 1000, cetostearyl alcohol, mineral oil, purified water, sodium phosphate monobasic, white petrolatum and chlorocresol is present as preservative. Topical corticosteroids share anti-inflammatory, anti-pruritic and vasoconstrictive actions.The mechanism of anti-inflammatory activity of the topical corticosteroids is unclear. Various laboratory methods, including vasoconstrictor assays, are used to compare and predict potencies and/or clinical efficacies of the topical corticosteroids. There is some evidence to suggest that a recognizable correlation exists between vasoconstrictor potency and therapeutic efficacy in man. The extent of percutaneous absorption of topical corticosteroids is determined by many factors including the vehicle, the integrity of the epidermal barrier, and the use of occlusive dressings.Topical corticosteroids can be absorbed from normal intact skin. Inflammation and/or other disease processes in the skin increase percutaneous absorption. Occlusive dressings substantially increase the percutaneous absorption of topical corticosteroids (See DOSAGE AND ADMINISTRATION).Once absorbed through the skin, topical corticosteroids are handled through pharmacokinetic pathways similar to systemically administered corticosteroids. Corticosteroids are bound to plasma proteins in varying degrees. Corticosteroids are metabolized primarily in the liver and are then excreted by the kidneys. Some of the topical corticosteroids and their metabolites are also excreted into the bile. Systemic absorption of topical corticosteroids has produced reversible hypothalamicpituitary- adrenal (HPA) axis suppression, manifestations of Cushing's syndrome, hyperglycemia, andglucosuria in some patients.Conditions which augment systemic absorption include the application of the more potent steroids, use over large surface areas, prolonged use, and the addition of occlusive dressings (See DOSAGE AND ADMINISTRATION).Therefore, patients receiving a large dose of a potent topical steroid applied to a large surface area should be evaluated periodically for evidence of HPA axis suppression by using the urinary free cortisol and ACTH stimulation tests. If HPA axis suppression is noted, an attempt should be made to withdraw the drug, to reduce the frequency of application, or to substitute a less potent steroid.Recovery of HPA axis function is generally prompt and complete upon discontinuation of the drug.Infrequently, signs and symptoms of steroid withdrawal may occur, requiring supplemental systemic corticosteroids.Children may absorb proportionally larger amounts of topical corticosteroids and thus be more susceptible to systemic toxicity (See PRECAUTIONS—Pediatric Use). If irritation develops, topical corticosteroids should be discontinued and appropriate therapy instituted.In the presence of dermatological infections, the use of an appropriate antifungal or antibacterial agent should be instituted. If a favorable response does not occur promptly, the corticosteroid should be discontinued until the infection has been adequately controlled. Patients using topical corticosteroids should receive the following information and instructions:This medication is to be used as directed by the physician. It is for external use only. Avoid contact with the eyes.Patients should be advised not to use this medication for any disorder other than that for which it was prescribed.The treated skin area should not be bandaged or otherwise covered or wrapped as to be occlusive.Patients should report any signs of local adverse reactions.Parents of pediatric patients should be advised not to use tight-fitting diapers or plastic pants on a child being treated in the diaper area, as these garments may constitute occlusive dressings (See DOSAGE AND ADMINISTRATION). Corticosteroids are generally teratogenic in laboratory animals when administered systemically at relatively low dosage levels. The more potent corticosteroids have been shown to be teratogenic after dermal application in laboratory animals. There are no adequate and wellcontrolled studies in pregnant women on teratogenic effects from topically applied corticosteroids.Therefore, topical corticosteroids should be used during pregnancy only if the potential benefit justifies the potential risk to the fetus. Drugs of this class should not be used extensively on pregnant patients, in large amounts, or for prolonged periods of time. Pediatric patients may demonstrate greater susceptibility to topical corticosteroid induced HPA axis suppression and Cushing's syndrome than mature patients because of a larger skin surface area to body weight ratio.Hypothalamic-pituitary-adrenal (HPA) axis suppression, Cushing's syndrome, and intracranial hypertension have been reported in children receiving topical corticosteroids. Manifestations of adrenal suppression in children include linear growth retardation, delayed weight gain, low plasma cortisol levels, and absence of response to ACTH stimulation. Manifestations of intracranial hypertension include bulging fontanelles, headaches, and bilateral papilledema.Administration of topical corticosteroids to pediatric patients should be limited to the least amount compatible with an effective therapeutic regimen. Chronic corticosteroid therapy may interfere with the growth and development of children. The following local adverse reactions are reported infrequently when betamethasone dipropionate products are used as recommended in the DOSAGE AND ADMINISTRATION section. These reactions are listed in an approximate decreasing order of occurrence: burning, itching, irritation, dryness, folliculitis, hypertrichosis, acneiform eruptions, hypopigmentation, perioral dermatitis, allergic contact dermatitis, maceration of the skin, secondary infections, skin atrophy, striae and miliaria.Systemic absorption of topical corticosteroids has produced reversible hypothalamic-pituitary-adrenal (HPA) axis suppression, manifestations of Cushing's syndrome, hyperglycemia and glucosuria in some patients. Apply a thin film of betamethasone dipropionate cream to the affected skin areas once daily. In some cases, twice daily dosage may be necessary.If an infection develops, appropriate antimicrobial therapy should be instituted.Betamethasone dipropionate products should not be used with occlusive dressings. Each gram contains betamethasone dipropionate 0.64 mg equivalent to betamethasone, USP 0.5 mg.Betamethasone Dipropionate Cream USP, 0.05% is white to off white cream, free from lumps and foreign matter with no phase separation is supplied as:NDC 70710-1233-1 in tube of 15 gNDC 70710-1233-4 in tube of 45 gStore at 20° to 25°C (68° to 77°F) [see USP Controlled Room Temperature].Protect from light and freezing.Call your doctor for medical advice about side effects. You may report side effects to FDA at 1-800-FDA-1088.Please address medical inquiries to, MedicalAffairs@zydususa.com or Tel. : 1-877-993-8779.